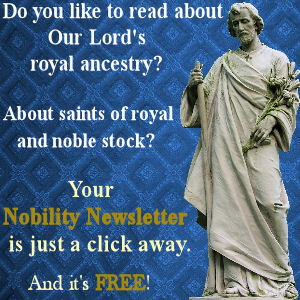 This martyr enjoys the distinction, unique in the Roman liturgy, of having a special commemoration in the second Mass on Christmas day. This Mass was originally celebrated not in honour of the birth of Christ, but in commemoration of this martyr, and towards the end of the fifth century her name was also inserted in the Roman canon of the Mass. Nevertheless, she is not a Roman saint, for she suffered martyrdom at Sirmium, and was not venerated at Rome until almost the end of the fifth century. 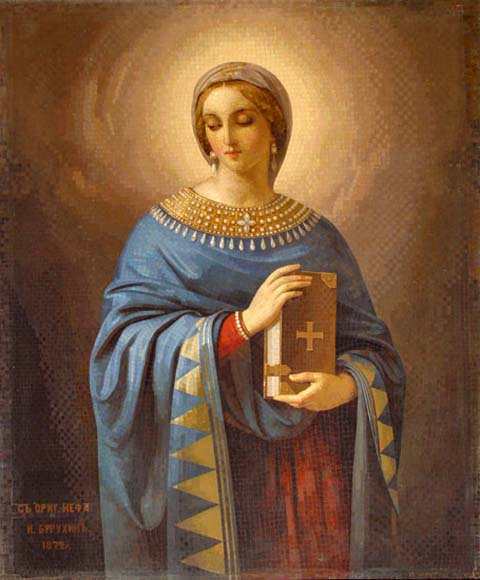 It is true that a later legend, not earlier than the sixth century, makes Anastasia a Roman, though even in this legend she did not suffer martyrdom at Rome. 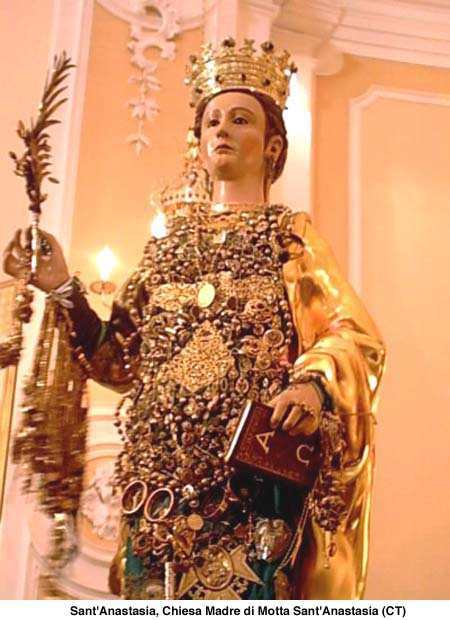 The same legend connects her name with that of St. Chrysogonus, likewise not a Roman martyr, but put to death in Aquileia, though he had a church in Rome dedicated to his honour. According to this “Passio”, Anastasia was the daughter of Praetextatus, a Roman vir illustris, and had Chrysogonus for a teacher. Early in the persecution of Diocletian the Emperor summoned Chrysogonus to Aquileia where he suffered martyrdom. Anastasia, having gone from Aquileia to Sirmium to visit the faithful of that place, was beheaded on the island of Palmaria, 25 December, and her body interred in the house of Apollonia, which had been converted into a basilica. The whole account is purely legendary, and rests on no historical foundations. All that is certain is that a martyr named Anastasia gave her life for the faith in Sirmium, and that her memory was kept sacred in that church. The so-called “Martyrologium Sieronymianum” (ed. De Rossi and Duchesne, Acta SS., 2 November) records her name on 25 December, not for Sirmium alone, but also for Constantinople, a circumstance based on a separate story. According to Theodorus Lector (Hist. Eccles., II, 65), during the patriarchate of Gennadius (458-471) the body of the martyr was transferred to Constantinople and interred in a church which had hitherto been known as “Anastasis” (Gr. Anastasis, Resurrection); thenceforth the church took the name of Anastasia. Similarly the cultus of St. Anastasia was introduced into Roman from Sirmium by means of an already existing church. As this church was already quite famous, it brought the feast of the saint into especial prominence. There existed in Rome from the fourth century, at the foot of the Palatine and above the Circus Maximus, a church which had been adorned by Pope Damasus (366-384) with a large mosaic. It was known as “titulus Anastasix”, and is mentioned as such in the Acts of the Roman Council of 499. There is some uncertainty as to the origin of this name; either the church owes its foundation to and was named after a Roman matron Anastasia, as in the case of several other titular churches of Rome (Duchesne), or it was originally an “Anastasis” church (dedicated to the Resurrection of Christ), such as existed already at Ravenna and Constantinople; from the word “Anastasis” came eventually the name “titulus Anastasix” (Grisar). Whatever way this happened, the church was an especially prominent one from the fourth to the sixth century, being the only titular church in the centre of ancient Rome, and surrounded by the monuments of the city’s pagan past. 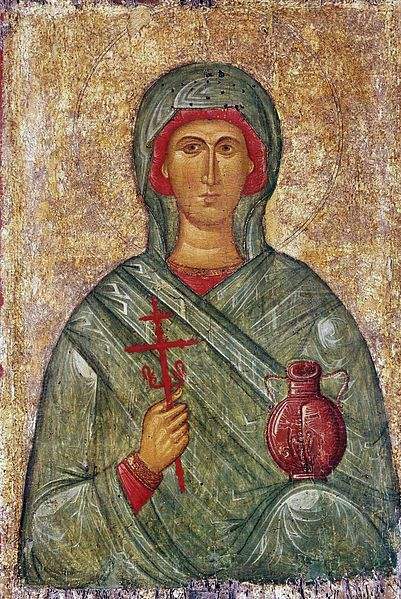 Byzantine Icon of St. Anastasia of Sirmium at the State Hermitage Museum, Saint Petersburg, Russia. Within its jurisdiction was the Palatine where the imperial court was located. Since the veneration of the Sirmian martyr, Anastasia, received a new impetus in Constantinople during the second half of the fifth century, we may easily infer that the intimate contemporary relations between Old and New Rome brought about an increase in devotion to St. Anastasia at the foot of the Palatine. At all events the insertion of her name into the Roman Canon of the Mass towards the end of the fifth century, show that she then occupied a unique position among the saints publicly venerated at Rome. Thenceforth the church on the Palatine is known as “titulus sanctx Anastasix”, and the martyr of Sirmium became the titular saint of the old fourth-century basilica. Evidently because of its position as titular church of the district including the imperial dwellings on the Palatine this church long maintained an eminent rank among the churches of Rome; only two churches preceded it in honour: St. John Lateran, the mother-church of Rome, and St. Mary Major. This ancient sanctuary stands today quite isolated amid the ruins of Rome. The commemoration of St. Anastasia in the second Mass on Christmas day is the last remnant of the former prominence enjoyed by this saint and her church in the life of Christian Rome.